NAMM 2017: Orange has announced a pair of lightweight, all-valve combos that are "the best partner for any guitar players' pedalboard", the Rocker 32 and Rocker 15. The Rocker 32 guitar amp is an all-valve 2x10" stereo combo with stereo effects loop, opening up opportunities for wet/dry or true stereo effects, while it packs 30W of power (15W a side), switchable down to half-power. A single 10" speaker delivers tones from the Rocker 15, which features a valve-driven effects loop and 0.5/1/7/15W power switching. 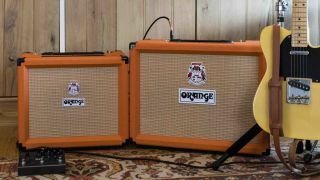 Both amps boast an all-valve signal path with two channels: Natural, which is voiced to bring out the natural character of different guitars and effects and features a single volume control; the second, Dirty channel, meanwhile, offers a three-band EQ and Orange's trademark grit. Four EL84s and six 12AX7 valves fuel the Rocker 32, while the 15 packs a pair of EL84s and four 12AX7s. The amps weigh 23.3kg and 13.6kg respectively. The Rocker combos also pack new 10" Voice Of The World Gold Label speakers and the same transformers as found in the Terror series. Orange's Rocker 15 and 32 are available soon for £599/$799 (Rocker 15) and £829/$1,099 (Rocker 32).